The Brut Reserve of Maison Palmer is made up of about 50% of Chardonnay, 40% of Pinot Noir and 10% of Pinot Meunier. The gustative qualities of The Brut Cuvée depend not only on grape varieties coming from 40 different crus; they also result from the wine making and wines’ ages which compose this Cuvée. Elaborated from a reference grape harvest (the main note), this accurate assemblage always includes an important part of Reserve Wines (until five years) which give and offer a rare plenitude and maturity. On the eyes, its robe offers a beautiful and bright straw-yellow color; the ring of beads is abundant and persistent. On the nose, the aromas are clear and cut; they develop a rich and wide aromatic palette, aromas of white fruits (pear), apple (cooked) , fruits freshly picked (apricot), with subtle notes of honey, fresh café, dried fruits (grilled hazelnuts, dried currants) and a discreet buttered touch evoking croissants and pastries. 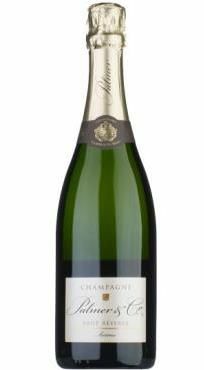 This Brut Reserve is The Champagne for any aperitif and can be served for any occasion or event. It may also goes well with a beautiful fish dish and its creamy sauce or a wing of guinea fowl with mushrooms.